Thanks to the generosity of Epson Canada and our supportive local representative Andrew Patrick, OCAD U’s Photography Program is pleased to announce that Epson is donating an Epson Printer (model to be confirmed) to a Photo major enrolled in Directed Photo Studio, Landmarks or Thesis during 2016/2017. Open to undergraduate Photography majors who are currently enrolled in the Photo Directed Studio, Landmarks or Thesis Stream. Applicants must have a practice that incorporates digital output such as digital negatives or prints. Open to students with diverse career goals. Applications must be submitted before Mon, May 8th at midnight to Jenn Long at jlong@faculty.ocadu.ca. In the subject line, note your name and Epson Award Application. Results will be announced in the late May. Your name, email and the 4th year course you were enrolled in. 5 to 10 examples of your strongest work that is created using a digital component (example: the final print may be a digital print or the work could be created using a digital negative). The selected images can be from a single series or diverse bodies of work. 250 words (maximum) explaining why you want this Epson printer and how it will be an asset to your future career goals. 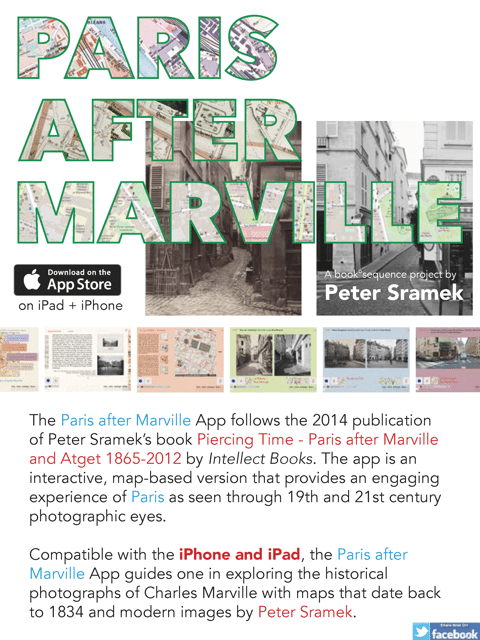 Congrats to Peter Sramek on launching version 2.2 of Paris After Marville in the Apple App Store! The new version,$3.99 CAD, solves an issue that blocked starting-up without a WiFI connection (thanks to Aquafadas’ constantly improving compiler) and a few navigation improvements that make the user interface more intuitive. Thanks to the generosity of Epson Canada and our supportive local representative Andrew Patrick, OCAD U’s Photography Program is pleased to announce that Epson is donating an Epson Stylus Photo R3000 to a 4th year photo student. Open to undergraduate Photography majors who have completed or are currently enrolled in the Photo Directed Studio or Thesis Stream. Applications must be submitted before March 13th at 1:00 pm to Barbara Astman at bastman@faculty.ocadu.ca. In the subject line, note your name and Epson Award Application. Results will be announced in the last week of April. 3 to 5 examples of your strongest work that is created using a digital component (example: the final print may be digital or the work could be created using a digital negative). The selected images can be from a single series or diverse bodies of work. 250 words explaining why you want this Epson printer and how it will be an asset to your future career goals.